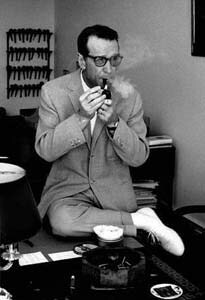 Georges Joseph Christian Simenon (French: [ʒɔʁʒ simnɔ̃]; 13 Februar 1903 – 4 September 1989) wis a Belgian writer. A proleefic author that published nearly 500 novelles an numerous short warks, Simenon is best kent as the creautor o the feectional detective Jules Maigret. ↑ "Georges Simenon - Author of Inspector Maigret". Georges Simenon (in Inglis). Retrieved 2015-11-10. This page wis last eeditit on 18 Mairch 2018, at 17:09.